The spring and summer months are flea season. Fleas flourish in temperatures between 65 and 80 degrees, with humidity in the 75 to 85 percent range. In some locations flea season is year round. In others, the types of fleas that bother pets and people aren't considered a big problem. If you live in an area where the little blood suckers thrive, you know controlling infestations is no laughing matter. It can often feel like a full-time job, in fact. In order to successfully keep these parasites away from your yard, home and family members (both the two and four-legged kind), you have to attack the problem on several fronts. Fleas are an unpleasant annoyance, and while they don't have the same deadly potential of other parasites, they can transmit tapeworms and even cause severe cases of anemia, especially in young animals. Fighting a flea infestation can be challenging – especially when you're determined to wage war without resorting to the use of toxic chemical agents in your home, yard or on your beloved pet. But be encouraged, because you can win the clean, green way with some knowledge, planning and experimentation. Stage 1 – Egg. Adult fleas lay eggs on your pet – from 20 to 28 a day. These eggs drop off your dog or cat and grow wherever they land, which is often on your furniture, carpets, throw rugs, and other flooring. 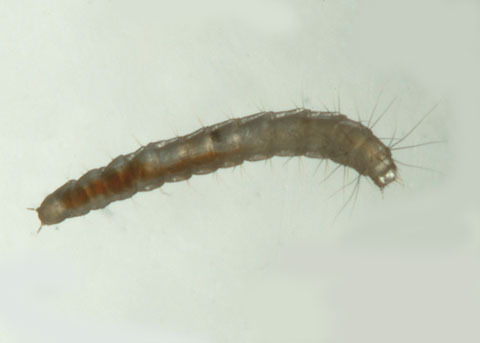 Stage 2 – Larva. This is what the egg turns into, little worm-like creatures. Larva hatch from flea eggs. Stage 3 – Pupa. The larva forms a pupae, a cocoon of sorts, inside which it moves through additional growth stages that can take anywhere from about 10 days all the way up to 200 to complete. Stage 4 – Adult. 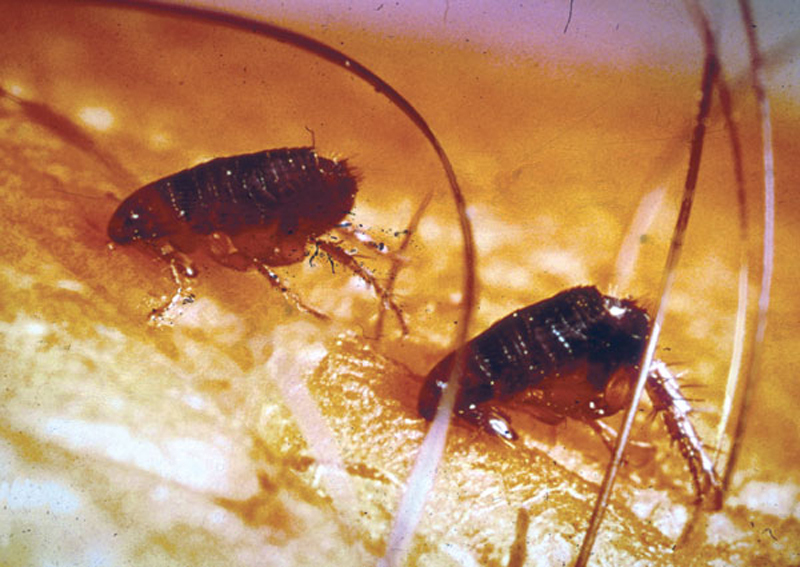 Adult fleas are what the pupae evolve to and they're what you see on your pet. They live on average about six weeks, but they can live a whole lot longer than that. The only way to remove adult fleas from their natural habitat (your dog or cat) is to kill them or pick them off. Fleas reproduce at an incredible rate. Ten female fleas can produce over 250,000 more fleas in a single month. Estimates are that for every adult flea on your pet, there are around 10 more wherever your pet spends time. That's why you must eliminate not only the adults on your dog or cat, but the eggs, larva and pupa in your home, yard and your pet's bedding. The pupa stage is the most problematic because the cocoon is quite resistant to agents that can kill fleas in the other stages of the life cycle. The only way to eliminate pupa is by vacuuming them up and disposing of your vacuum's contents right away. Even if you manage to kill all the adults, eggs and larvae, if you don't get rid of the pupae, you'll have more fleas in short order as the adults hatch from the pupae. It takes about 45 days of diligent effort to fully resolve a flea infestation. Parasites are drawn to the weakest of the species. So the first battle to be engaged in your war on fleas is insuring your pet's health is optimum and her immune system is strong. Feeding a high quality, species appropriate diet is the foundation for your pet's good health. Regular exercise helps your pet stay at a healthy weight and keeps her joints strong and her muscles toned. Over-vaccinating your pet can devastate immune system functioning, as can the overuse of drugs like antibiotics and corticosteroids. If you're in the middle of a major flea infestation, resolve that first using the following information. Then go back and take steps to bring your pet's overall health to an optimum level. Flea combing is one of the safest and best methods for removing adult fleas from your pet. Comb your dog or cat at least daily on a white or other light colored towel so you can see what you're removing. Drop the combings into a bowl or other container of soapy water and flush it down the toilet when your combing session is over. Even when you're no longer seeing fleas or flea residue on your pet, it's a good idea to continue to comb him daily until you're sure his environment is completely flea free. Bathe your pet frequently (tips on shampoos and rinses can be found at the link) while you're fighting a flea infestation. Fleas are less attracted to clean animals and the shampoo will kill any fleas on your pet if the water doesn't get them first. The good news is even parasites can drown! Your dog or cat will feel better after a soothing bath as well. Vacuuming all the areas of your house your pet has access to is the best and safest way to control fleas in your home. And it's a virtual necessity for removing fleas in various growth stages so they don't reach adulthood. You should vacuum carpet, rugs, bare floors, furniture, pillows, your pet's bedding and even your own if your pet sleeps with you. Break out the crevice tool or other attachment and vacuum along the baseboards and around corners and the edges of furniture. You'll also need to get to hard-to-reach and dark places like under furniture and beds, and in closets. Dispose of the contents of your vacuum immediately, away from your house. If possible designate one sleeping area for your pet, preferably an area that will be convenient to clean. Flea accumulations are often in pet sleeping spaces, so if you can limit your dog or cat to one area, it should make things a bit easier for you. Pet bedding should be vacuumed daily if possible, and removed and washed frequently during a flea infestation. If you use diatomaceous earth on your flooring to kill fleas (more on this below), be careful not to overdo it, as it has been known to clog vacuum cleaners. I don't recommend chemical products to eliminate fleas in or outside your home except in extreme situations or when less harmful approaches have failed. • Diatomaceous earth (DE). You can apply a light dusting of food grade diatomaceous earth (DE) on your carpets, bare floors, your pet (take care not to get it in or near his eyes) and his bedding. Make sure the DE is food grade, not pool filter grade as the latter is toxic if ingested. Diatomaceous earth is a naturally occurring porous rock composed of the shells of diatoms, which are one-celled algae with cell walls of silica. This light-colored, porous rock forms a fine white powder when crushed. The powder kills fleas by dehydrating them from the outside in. • Cedar oil. Like diatomaceous earth, cedar oil can be applied to your environment and pet bedding, as well as directly on your dog or cat. It is an all-natural insect repellent. Pestigator.com has a wealth of information about the use of cedar oil as well as a wide variety of cedar-based products for indoor, outdoor and direct pet application use. • Sodium polyborate powder. You can apply this powder to your carpets and wood floors to get rid of fleas at the larval stage. Instructions at Fleabusters.com state you should keep pets and children out of the room while you're applying the product, but they can come into the area safely immediately afterward. The powder works for a year once it's applied unless you have your carpets steam cleaned. • Mosquito Barrier. This is an all-natural, liquid garlic based solution that can be sprayed on your lawn. Its repellent effect should last about a month according to the manufacturer. • Nematodes. Nematodes are microscopic roundworms that eat flea larvae. Many people have had success using them in their gardens and yards to keep the flea population under control. Under the right conditions, nematodes work quite well. They can be applied with a lawn sprayer and have been known to reduce the flea population by 80 percent in 24 hours. More research is needed, but it seems nematodes are most effective in moist, sandy soil away from direct sunlight. The worms don't survive in the hot sun. (Fortunately, neither do fleas.) Nematodes can be purchased at some pet stores, nurseries and online. It's my firm belief that the dangers of chemical flea prevention products (sprays, powders, collars, dips, shampoos, pills, etc.) outweigh the benefits unless your pet's health or comfort is being compromised. Fortunately, with a little extra effort, it's possible to keep your pet flea-free using safe, natural alternatives to "spot on" and similar types of toxic chemicals. As I mentioned above, the flea comb is your number one weapon against the adult fleas on your pet that are busy making more fleas. I also encourage you to work with a holistic veterinarian that can provide you with flea-fighting guidance as well as a number of different products for safe pest control. Essential oil sprays containing lavender, peppermint, geranium, lemongrass or citronella can be very effective as parasite deterrents. You need to purchase a pre-blended product or work with an animal aromatherapist to make sure you're using safe oils at the correct concentration. Dog and cat doses are different, and many cats are extremely sensitive to oils, so don't guess. Fresh garlic can be given to dogs and cats to prevent internal as well as external parasites. Processed garlic has lost the quantity of allicin needed to repel pests. Work with your holistic vet to determine a safe amount for your pet's body weight. You may have to start with considerably less than that amount if your kitty is finicky, then build up gradually to the recommended amount. Make sure your pet is getting B vitamins, preferably from natural sources like raw meat. If you want to use a supplement, a whole food B complex vitamin is a better choice than a synthetic variety. Brewer's yeast (high in B vitamins) is often recommended to bolster vitamin B levels, but because many pets have allergies that are exacerbated by yeast, I don't recommend using brewer's yeast for allergic animals. You can put both food grade diatomaceous earth and cedar oil directly on your pet's skin and coat. Follow label or package instructions on proper application. You can also add DE into your pet's food. Ectopamine Spray is a relatively new all natural product made from essential oils that is working well for many pet owners. For pets with a serious case of flea allergy dermatitis (FAD), which means they are hyper sensitive to flea saliva, I prescribe a drug called Comfortis. It's a chemical, unfortunately, but it's considered the "greenest" of all similar drugs. I've yet to see a reaction to Comfortis in an FAD-afflicted patient. I can't overemphasize the need to avoid the unnecessary application of chemical products, as they are proving to be every bit as toxic as we feared. • Follow dosing directions precisely. If your pet is at the low end of a dosage range, step down to the next lowest dosage. Be extremely cautious with small dogs and do not under any circumstances apply dog product to your cat. • Don't depend exclusively on chemical treatments. Rotate natural preventives with chemical ones. An every other month rotation works well for many pet owners. Many of my clients are able to apply one round of chemicals in the spring and another late summer and completely avoid infestation while dramatically reducing the frequency of chemicals used. • Monitor your pet closely for adverse reactions after you apply a chemical product – especially when using one for the first time. • Since your pet's liver will be tasked with processing the chemicals that make it into the bloodstream, it can be very beneficial to give your dog or cat a supplement to help detoxify her liver. I recommend milk thistle, which is a detox agent and also helps to actually regenerate liver cells. • I also recommend chlorella, a super green food that is a very powerful detox agent. Your holistic vet should also advise you about how much chlorella to give your pet.